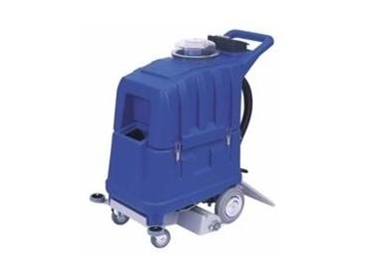 Elite Silent carpet cleaners, supplied in Australia by Kerrick Industrial Equipment , are self-contained, walk behind units capable of cleaning large area carpets, and feature a built-in rotating brush. These carpet cleaners shampoo, brush and dry a 50cm path while emitting only 60db of sound, with an optional squeegee attachment that can be applied to the carpet extractor to allow them to also clean hard floors. Squeegees are easily connected to these units via a special push-coupling without the need for any tools. The angle of the squeegee with respect to the hard floor surface can also be tuned by hand. Tanks on these units separate for transport, and brush pressure and water flow are both fully adjustable. An instant hot water unit can also be fitted for deep cleaning of very dirty carpet or textiles.